We can’t deny that everybody needs food to live. But, food also serves as a pleasure variable that satisfies our stomach after one bad day. It is also said that food helps you cope up with stress and hurt, that is why there is such a term called stress-eating. Although it may seem that food can also be a factor in giving us energy throughout the day, it can also be one of the reasons we get fat and go unhealthy. Too much intake of food increases your chances of heart attack and other diseases. That reason alone should give you an awareness that it is important to watch what you eat every day and how much of it. You may also see excel journal templates. 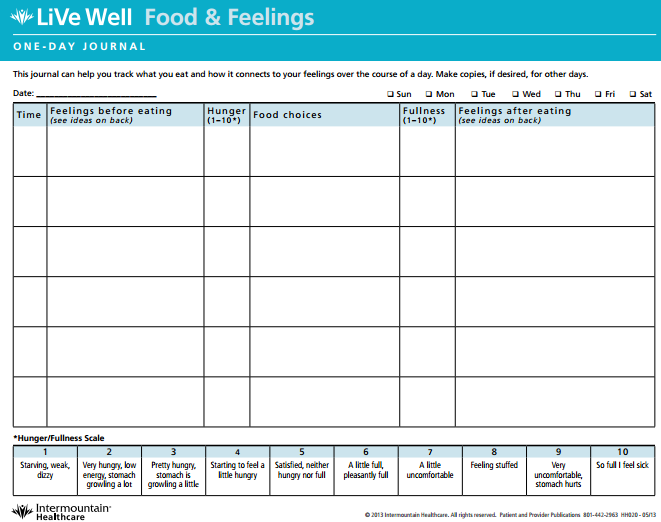 One way for you to watch what you eat is through a food journal or diary. 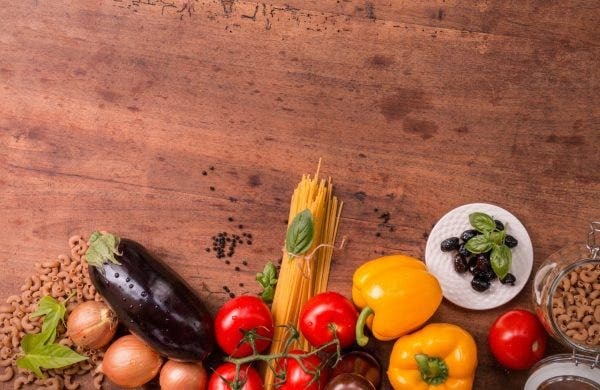 In this article, we will introduce you what is basically a food journal and along with it, templates to give you a better vision of what it really looks like. 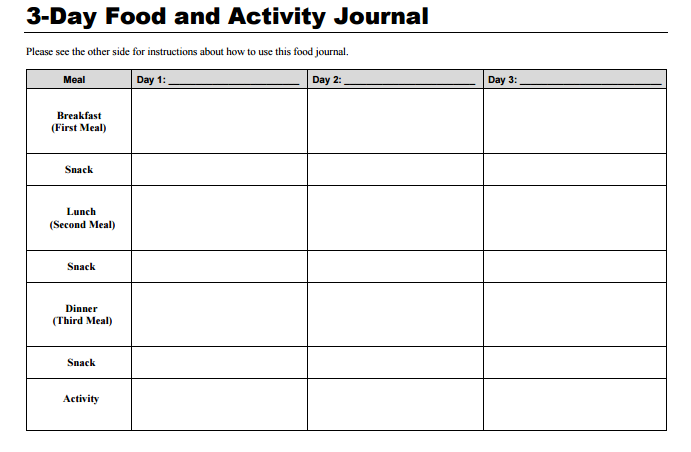 We will also be providing the general parts of a food journal and how you can keep one to make writing an entry consistent. Lastly, we will mention other uses of a food journal as well. You may also check out word journal templates. So, you might be wondering what is the true purpose of a food journal by now. In a way, it is like any other journal we write about, only it has some slight modifications. 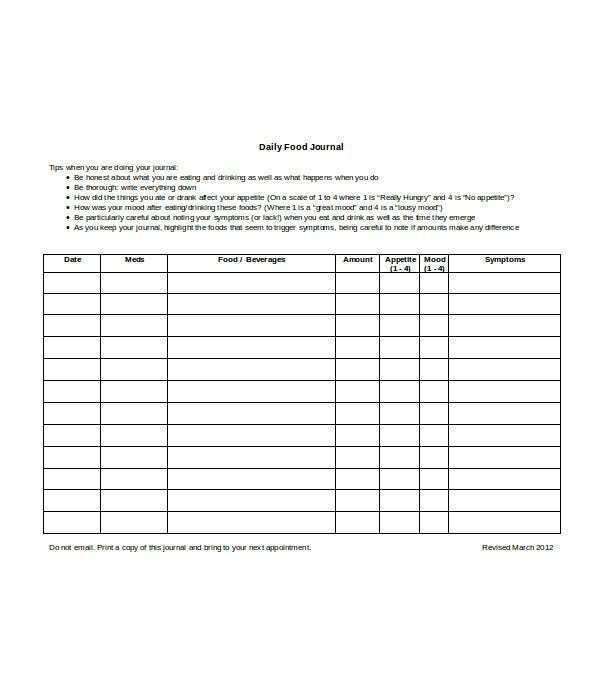 There are many kinds of journals like the food journal, reflective journal, prayer journal, academic journal etc. But one common thing about them is that you are given the chance to write. Write about what? Your feelings and reflections. You see, a journal is a way for you to write about words that cannot be said or a place where you can write the little and unforgettable memories you have experienced in the present day which you will be able to read again when you are old and reminisce what happened and why, if ever you would not lose it of course. The food journal is basically another kind of journal in which you are reminded of what you ate for the past days, or week, or month, or even years. You may also check out prayer journal templates. 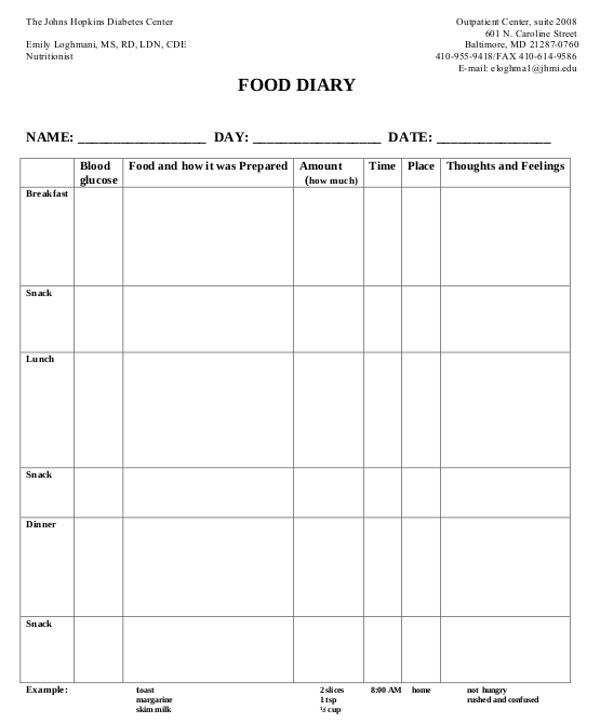 It serves as a reminder because the general purpose of a food journal is for one to look what he or she eats and how much of it within a given week. It is used by people who want to watch what they eat and drink and think if they should eat less the next week or more depending on the quantity one has eaten the week before. Even the snacks part of the day can be written because it can also affect your weight and nutrition depending how heavy it is. Writing a food journal is also not limited to those people who are advised to. Anyone can write a food journal entry just like how anyone can write about anything in a journal. You might be interested in travel journal templates. 1. Days. 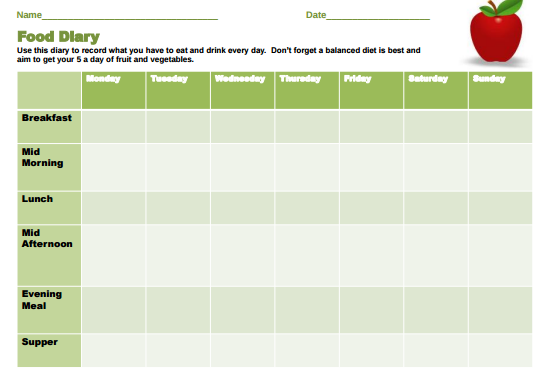 In a food journal, the days within a week are never absent. Why? So that you remember every meal you have eaten in the day. 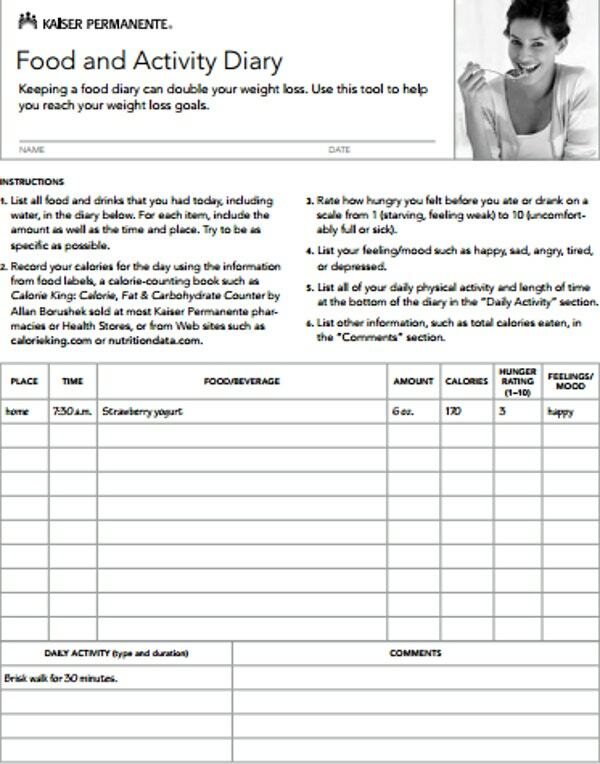 You may also see fitness journal templates. 2. Food. This pertains to the food you have eaten. It is important for any food journal entry to include the quantity of food you have eaten in a particular time of the day. If you ate two grilled chicken or steak, specify that you ate two. You would also want to include if you have taken any soft drinks or juice. Additional to that, you can also include how much of protein it contains and what were the ingredients being applied on for that certain dish. You may also like journal cover designs. 3. Hunger Level. It is a good practice if you indicate how hungry you were before you ate during the specific time of the day. One of the reasons for this is because you can analyze if you feel the same hunger the following day at the same time. Just do not over exaggerate your hunger. Writing a journal may be a free expression thing but it is important you are honest about your feelings and experiences. You may also check out reflective journal templates. 4. Emotional State. This pertains how you felt before, during and after you ate. This would help you identify if the food you ate within that particular time of day can really satisfy you and make it a go-to food whenever you are having bad days. But be careful, because it might also be one of the reasons why you are gaining weight despite it being a comfort food. Review the ingredient again and again. Make it a habit. You might be interested in garden journal templates. 5. Excercise. Weird as it may sound, you can do little exercises after you eat even if you are at work. From walking back and forth to stretching the legs or the occasional jog after office hours is relevant information in the journal. This can also serve as an exercise journal. You can input how many rounds of different kinds of exercises you have done and if there is a need to add those rounds or move on to another kind of exercise. You may also see reading journal templates. These, my friend, are the basic parts of a food journal entry. You might also want to include a cheat day every week if you think you deserve one or if your health doctor has advised you. I mean, it is always beneficial to have a day to eat what you want without limits once a week right? Just make sure that on the next day, you would go back to your limiting habits of eating and back on the treadmill. You may also like gratitude journal templates. One reason why so many failed to complete their diet goals and have the fit body towards the end is because of inconsistency. Inconsistency can be because of many reasons. One to mention is that people fail in maintaining a good lifestyle by watching over the food they ate simply because they are not disciplined enough. Two is when people convince themselves that if they will increase their cheat day in a week, they will also increase their eating limitation after. Which in most cases, often never happens. And, the reasons just goes on and on. But in this final part of the article, we will be giving you tips to avoid that failure of getting the goal achieved. You may also see food order templates. This is probably one of the simplest ways to be consistent in your journal entries. If you want to bring it to you everywhere you go, make sure your journal is easy to carry and is not that long so that you will not have a hard time putting it in your bag. Also, always be ready with a spare ball pen. 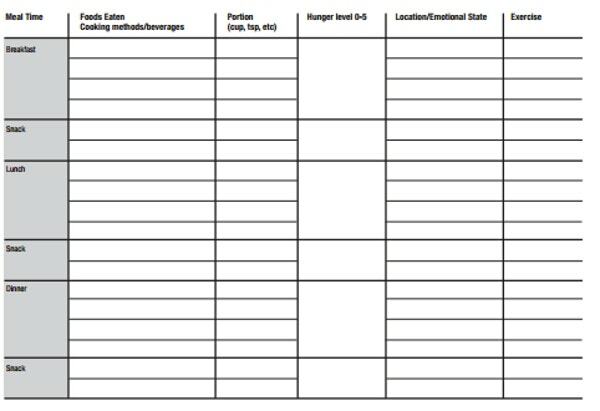 You may also like food inventory templates. If you are not a fan of writing in a notebook, then you can just choose to download a food journal app. This way, it can be easier for you to just type about what you ate and won’t have to carry or bring a notebook wherever you go. The advancement of technology is certainly a beautiful thing. 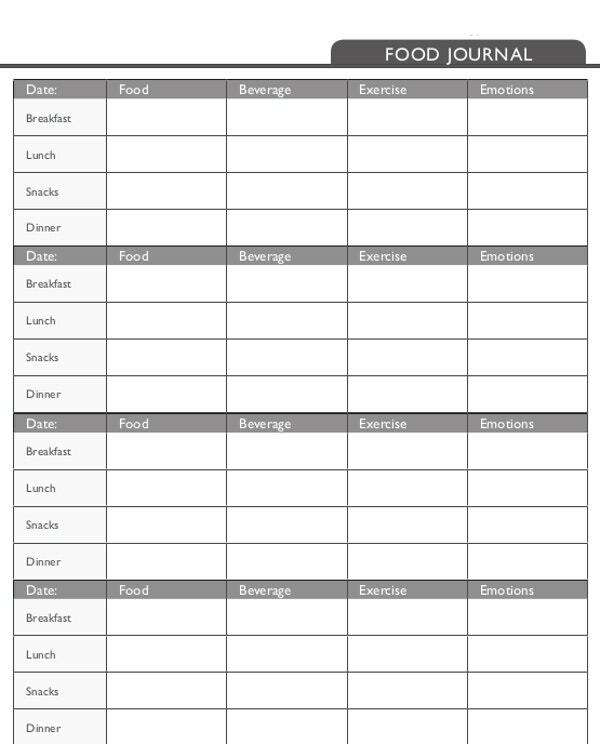 You may also check out food calorie chart templates. Take a picture of your body every week and see if there is any significant transformation. By knowing if there is any loss in weight, you can either choose to keep doing what you are doing or improve it by finding the best food to eat that won’t make you so heavy but still have the power to exercise. This simply means that you should not over exaggerate what you ate and not put false information of something you never ate during the day. If you ate more than your planned quantity of food, write it. Being accountable for your actions is a good practice and to be disciplined can further give you awareness to try to be better and hopefully actually do it. You might be interested food label templates. At the end of the week, read and reflect what you went through, in terms of the food you have eaten. Notice patterns and strays of your emotions and exercise habits after you finished a meal. Check also if there was any progress by checking your weight every full week. Making this habit can lead you to be more consistent in trying to achieve your weight goals without the fear of having a setback because of lack of discipline. Reflection is one of the key purposes of a journal. If one would reflect deeply, he can make the necessary changes needed to bring one closer not only to a body goal but also to a healthier lifestyle. 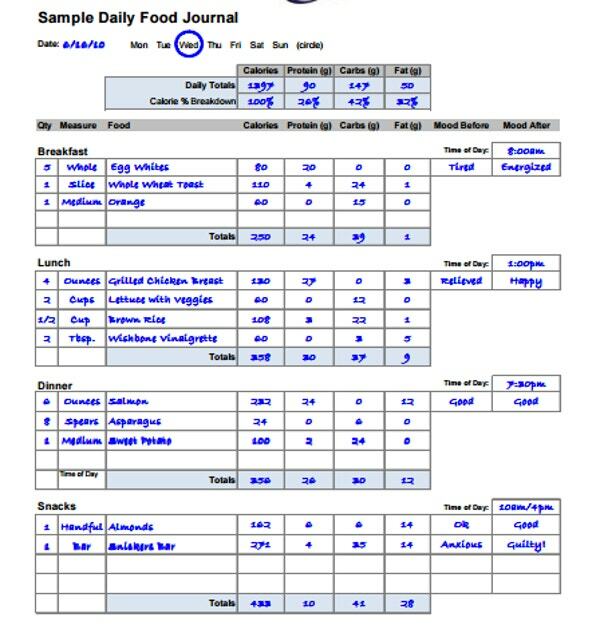 You may also see food survey templates. These are generally the ways on how to keep your food journal. Consistency is important even if it means cutting off the intake of your favorite food just to save your heart from dying or having the risk of a heart attack in the future. Find a way to remind yourself to write about what you will eat in a day so that you will avoid the scenario while you will just sit down and cry because you are getting fat while eating some junk foods or some donuts. Remember, nothing will ever happen if you do the same things over and over again. Change it and improve it. We only have one life to live. Make sure you make it worth living. Having a healthy body can make you live your life more to the fullest with the experiences that it can offer you. I mean let us face it, no one wants to die fat and was not able to experience great moments or achieve monuments. Don’t limit the food journal as a way for you to have that body goal but stretch it as far as how long you can live in the years to come. You may also like food magazine templates.